Bear right after toll plaza. Follow signs to 95 South. Bear left onto 278 West, Bruckner Expressway. Take (278 West) Bruckner Expressway to exit 47(87 North) Major Deegan Expressway. Take 87 North (Major Deegan Expressway) to exit 2 Willis Avenue, Third Avenue Bridge. Upon exiting (87 North) Major Deegan Expressway, proceed straight (north) on east 135th street (which runs parallel with the expressway) for four traffic lights to Third Avenue. Turn left (west) on Third Avenue to Third Avenue Bridge. Cross the Third Avenue Bridge. Take the Lexington Avenue exit. Turn left (south) onto Lexington Avenue. Continue downtown (south) on Lexington Avenue to east 97th street. Turn right (west) on east 97th street for 3 blocks to Fifth Avenue. 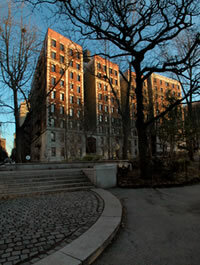 Continue past Fifth Avenue; enter 97th street park transverse to Central Park West. At end of transverse turn left (south) onto Central Park West 6 blocks to 91st street. Turn right (west) onto 91st street. Proceed straight 5 blocks to Riverside Drive. Turn sharp right (north) onto Riverside Drive 1-1/2 blocks to the Terrace Court, 202 Riverside Drive, between 92nd and 93rd Streets.